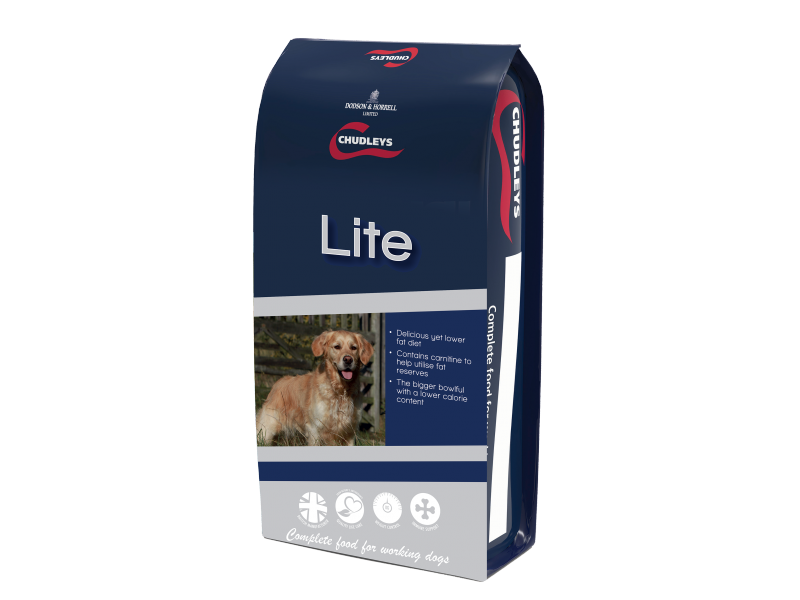 Chudleys Lite is a low calorie dog food designed for overweight dogs and those that maintain weight too easily. This tasty combination of chicken, vegetables and whole grains is full of key nutrients which support your dogs' general health and wellbeing, with selected dietry fibre sources that help keep your dog fuller for longer. It also includes prebiotics that help support digestive health, and carnitine which utilises fat reserves and supports weight loss. Whole grain wheat, Whole grain oats, Chicken meal, Whole grain maize, Whole grain barley, Chicken liver, Unmolassed beet pulp, Rice, Prairie meal, Yeast, Alfalfa, Peas, Carrots, Salmon oil, Dicalcium phosphate, Sodium bicarbonate, Potassium chloride, Cinnamon, Fructose & mannan oligosaccharides, Yucca, Blackcurrant, Kale, Spinach, Beetroot, Rosemary, Rosehip & Pomegranate. There are currently no questions for Chudleys Lite Overweight Dog Food - be the first to ask one!